On Saturday, seniors Mikey Diliberto, Nico Del Junco, Capri Sano and Adam Young of the then-No. 8 Cal men’s gymnastics team were honored for senior night. Ideally, Saturday should have been a cheerful night given that everyone was celebrating the seniors one last time in Haas Pavilion. 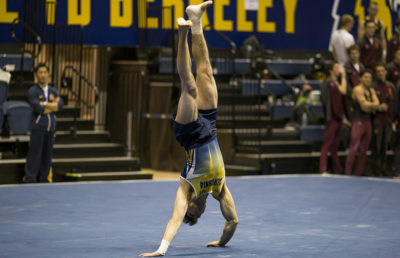 Yet to the dismay of Cal gymnasts and fans alike, the evening took a disappointing turn, with Cal losing once again to a lower-ranked team. The Bears fell behind the then-No. 10 Air Force Falcons, but came out ahead of No. 20 SC United in a home tri-meet. Now in the midst of a four-meet losing streak, the Bears have dropped in ranking to tenth place, while the Falcons have moved up to ninth. This home meet marked the Bears’ lowest earned team score of the season, even though they came in less than 10 points below the Falcons and ended the night with a score of 403.900-395.750. It also marked another significant moment in the Bears-Falcons rivalry, as the Falcons — who had lost all competitions against Cal up until Saturday — finally got their long-awaited first win, bringing their overall record against the Bears to 1-40. While SC United came in third place in each event, Cal came in second with the exception of the high bar and parallel bar events. Falcons senior Tim Wang had a role in these placings, as he earned the highest score for his team in each of the events that the Falcons won. Wang ended up earning three event titles Saturday evening, specifically in the pommel horse, rings and vault. 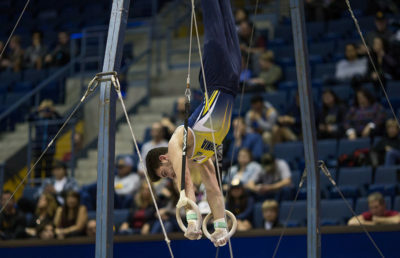 Wang also went on to earn the highest all-around event score, characteristically dominated by Cal sophomore Aaron Mah and junior Yordan Aleksandrov. Mah and Aleksandrov ultimately did perform well, but came in second and third in the all-around competition, respectively. 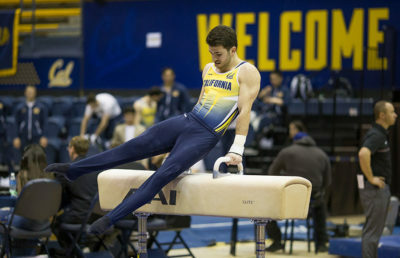 On the pommel horse, Cal’s weakest event and Wang’s strongest, the Bears surprisingly did not trail too far behind the Falcons. Wang had a remarkable score of 14.700 on the apparatus and his team ultimately scored a 65.550. Every Bear competing in the event, however, achieved a score between 12 and 13, except Aleksandrov, who struggled and surprisingly scored a 10.850. SC United, in contrast, struggled the entire evening against its two NCAA top-10 competitors. The highest individual score a SC United gymnast earned in any event was Cameron Edwards-Rea’s 13.750 on the still rings. In three of the events, namely the still rings, parallel bars and high bar, SC United had gymnasts with scores of zero. 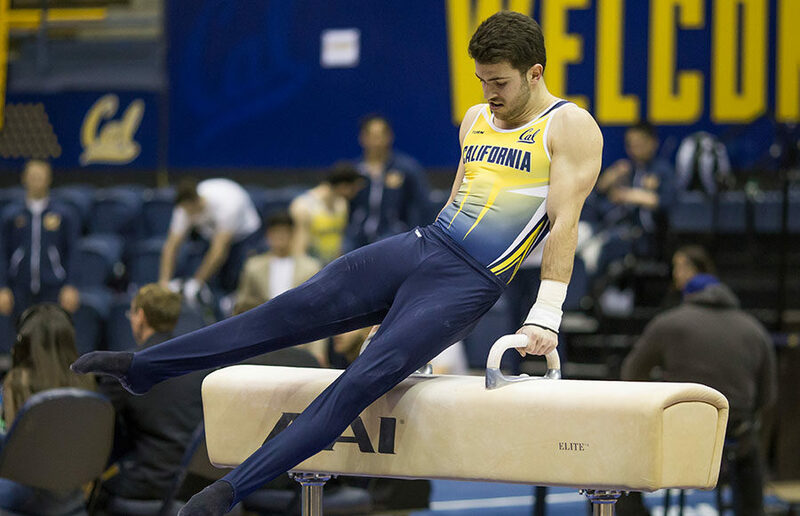 Although it wasn’t quite enough to win the meet, Cal’s gymnasts shined on the high bar and parallel bar events. Aleksandrov performed especially well, earning the team’s highest individual scores in each event with a 14.150 and 14.000, respectively. The Cal junior took home the high bar event title of the night. Losing is tough, especially when it’s senior night and the loss is against a lower-ranked team. The meet results are demoralizing, but the Bears need to find the problem that continues to beset every one of their meets before they lose the rest of their meets.